Thanks to a heads up from one of our Twitter followers, Paul Peeters, we have found out that Pioneer Electronics UK has tweeted out a possible release date for the pending CarPlay firmware update for its NEX receivers. Their best guess is early August. They also suggest that the update cannot be released unless Apple approves them to do so. Seems like Apple is controlling the whole situation. An early August release, which is about a week from today, in the UK raises a few questions. Will Pioneer make the update available to North America, Europe, the UK and other places at the same time? Or will the update become available in Europe and the UK before other places? Previously, firmware updates have been released within a few days of each other geographically with Europe and the UK getting it first. Since the CarPlay update has already been delayed, it might be released all at the same time all over. Looks like we will have to wait another week or so to get the update. 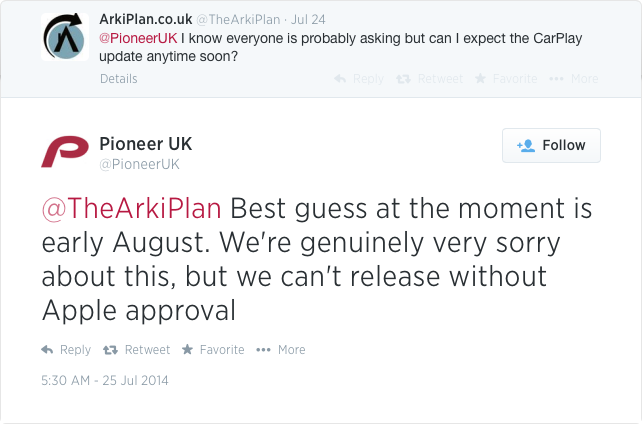 But Pioneer UK's early August suggestion is only a guess. Wait we shall! I sure hope its finally coming!